COMMENT: Why fight racism when you can incite racism to sell newspapers? I am another brown person. I can say unequivocally, on behalf of every other non-white person in the country, that hearing about racially motivated crimes frightens us. To an aggressor bent on beating up a "fob" (fresh off the boat) or a "curry", it does not matter that I was born here, and that my parents came here long before the attacker was born. To the aggressor, I simply match the description of their target. What concerns me is that each time an attack against an Indian is reported, Victoria Police has quite determinedly ensured the issue of racism is not closely linked to the crime. Inspector Scott Mahoney said that "sometimes, it's just a combination of timing and chance". Is that supposed to mean that the attackers don't see colour when they incessantly find targets of Indian appearance? These "chance" encounters that he describes are occurring with alarming regularity. With respect, the inspector's analysis is flawed. Victoria Police has itself claimed that people of Indian background are "over-represented as victims". When both the victims and the aggressors claim that these attacks are racially motivated, what purpose does it serve to avoid a discussion about racism? So far, we have seen police directing their attention to victims and potential victims, telling them they should not speak loudly in their native language or travel on public transport with their MP3 players on display. 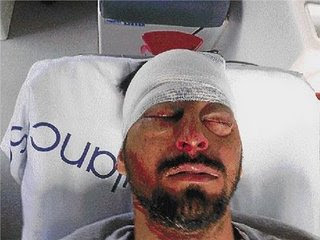 Police also set up a hotline for Indian victims after the attack on Sharma. I fail to see how these measures tackle the cause of the attacks. Now the police plan to go to India to educate Australia-bound students on how to minimise the risk of being attacked. I thought the police said these attacks were opportunistic? Why, then, are they going specifically to India to advise Indians on safety? Or is this simply a business trip to ensure Indian international students continue to bring education revenue into the state by allaying their fears? If it is racist hate-crimes we are looking at, just call them racist hate-crimes. Who or what is committing them is irrelevant. But Andrew Bolt, provocateur-in-chief for the Herald Sun, isn't interested about the race of victims. Why is that, Andrew? Are they of the wrong colour? Instead, Andrew wants to accuse the whistle-blower of being involved in a cover-up. Jeez, Andrew, does it really matter what ethnic background they are when the gangs perpetrating the incidents are themselves of no single ethnicity? What is the point of pointing out each ethnicity of each perpetrator? What will it prove? That non-whites have the ability to be racist also? That perpetrators of every race and colour can be inspired by the same violent and racist sentiments that you allow onto your blog? And that companies like Dell (whose banner advertisement appeared on Bolt's blog when I accessed it) sponsor? The two most senior Muslim coppers in the UK are being had up, separately, on charges of serious fraud. Their defence is that the police ‘system’ is ‘institutionlly racist’. This is what happens when cultures (not races!) who do not share Western values in the rule of law and blind justice (and much more besides) infiltrate rather than assimilate. It is too late for Britain (and Holland and France and Canada) but not too late for Australia. Why is it that Hindus don’t run around the planet beheading people, stoning women to death, letting off bombs and flying planes into buildings? Probably because Hindus are too busy getting bashed up in Melbourne. Had Andrew Bolt and his cyber-buddies read the balance of Hussain's article, they would have understood his point. There's no point Victorian police heading off to India to warn people there of the dangers lurking on our trains. Maybe what they should do is deal with the problem here. And acknowledge that these attacks are almost certainly racially motivated, regardless of who is perpetrating them. ... a sweet but rather dim-witted Pollyanna view of the world. She was upset that the Obama administration was moving away from torture, secret prisons, extraordinary renditions and keeping dangerous terrorists at the Hotel Guantanamo. Lord knows how she must feel about Obama releasing the so-called torture memos. And anyone who cares about the future of Western civilisation must be horrified at the prospect of hard-working Bush administration officials, among them senior legal advisers, being prosecuted for sanctioning torture. Of course, if the torture really was geared toward merely protecting American citizens, torture hawks and opponents of that unruly beast we call the Rule of Law might have a point. But a fair amount of the torture was used merely to elicit evidence supporting a decision to go to war in Iraq. So we torture people to provide us with evidence to prosecute a war in another part of the world where we torture more people. Last summer, I testified before the House Judiciary Committee on a couple of occasions and one of the Republican congressman, Trent Franks, put to me, "What's all the fuss about? If waterboarding was used, it was used on no more than three men for a total of one minute each, grand total three minutes." In fact, we now find out through the release of these memos that two men were waterboarded a total of 266 times, which is absolutely astonishing. One individual 183 times. And you really have to ask yourself, you know, when they got to waterboarding event number 83, did they really think there was anything more they could get out of him? Australia and Britain were very supportive of President Bush's war on terror. I haven't focussed on the Australian situation, but if Australia was half as involved as Britain, then it seems likely that material will come out. I mean, the US wasn't on its own on these issues and it's to the great credit, I think, of the present administration that they believe in transparency and openness. They're putting materials out. That's going to cause some difficulties for some of the United States' allies, I suspect. GQ Magazine carries an interesting and lengthy feature article profiling former US Defence Secretary Donald Rumsfeld through the eyes of his colleagues in the Bush administration. You'd think those working with Rumsfeld would be somewhat more charitable than openly ridiculing him. No such luck for Bush'd war monger. ... in speaking with the former Bush officials, it becomes evident that Rumsfeld impaired administration performance on a host of matters extending well beyond Iraq to impact America’s relations with other nations, the safety of our troops, and the response to Hurricane Katrina. A major criticism of Rumsfeld was his insistence on stalling decisions that had to be made. This had a direct impact on the military tribunals at Guantanamo. 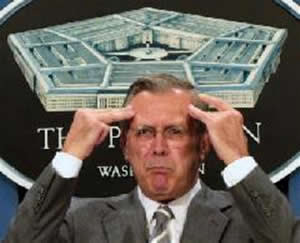 Rumsfeld also wasn't so keen to share access to American intelligence capabilities to its allies including Australia. Similarly, Rumsfeld delayed the implementation of a 2004 presidential order granting our Australian and British allies access to the Pentagon’s classified Internet system known as SIPRNet. “He always had what sounded like a good reason,” says one of Bush’s top advisers. “But I had a lot of back channels and found out that it was being held up.” It finally took Australian prime minister John Howard forcibly complaining to Bush about the matter in the fall of 2006 for SIPRNet to become accessible. It's great to see Howard putting his foot down to Bush about something. I've been having fun following changes to an entry made about me on Wikipedia. In particular, I've enjoyed following some more malicious entries made by one person who calls him/her/itself "Johnnyturk888". It seems JT888 is determined to paint me as some kind of child of bin-Ladin. While in Pakistan, he attended an Islamic religious school, called a maddrassa where he came to believe in sharia law and an Islamic form of government. I attended a madressa in Karachi for a period of 6 months. I was 6 years old at the time. How a 6 year old could come to believe in any particular legal and governmental system beats me. In 2009, Yusuf was part of a Christian photo opportunity washing the feet of the homeless. Actually, I have been washing feet with Bill Crews and a few Buddhist monks on the Thursday morning before Easter since 2006. Johnnyturk888 has been on a continuous campaign to smear and undermine the subject of this biography. The problems with his edits have been pointed out repeatedly, yet he repeats them over and over again ... His attacks on Yusuf aren't overt, but their derogatory intention is clear in the aggressive insistence on misleading and inaccurate depictions including poorly sources material and statements taken out of context. I don't want to spend any more time reverting his edits, so I think it's time that Johnnyturk888 is encouraged to move along. It's a bit hard for someone in the throws of complete obsession to move along. Still, JT888's strange fixation with me does make entertaining reading. What's the big deal with a bit of evangelism? Better a Bible than vicious dogs at your testicles, I say. Except that handing out Bibles confirms all the stereotypes Arabs and Afghans have of Coalition forces occupying the country just to bring Iraq and Afghanistan into the broader "Christian empire". Taliban propagandists will have an even bigger field day than they are already having with US bombardments on US civilians. The highest ranking military officer in the United States says it's not the military's position to ever push any specific form of religion, in response to an exclusive Al Jazeera report that showed a group of US soldiers in Afghanistan in possession of Bibles translated into local languages. The troops discussed giving the Bibles to Afghans as gifts - despite military directives banning soldiers from spreading religion, as Al Jazeera's James Bays reports. We’re living in the age of bailouts, and Pakistani President Asif Ali Zardari knows it. During his recent meeting with the House Foreign Affairs Committee, Zardari likened his request for billions of dollars in military and other aid to the US government bailout of AIG. The implication of this, of course, is that Pakistan is being severely mismanaged in much the same way as bailed out corporations. Many Pakistanis won’t dispute this. Two nights ago during a TV debate on the independent Pakistani cable news channel Aaj TV, there was near-unanimity among pundits (including former leaders of Zardari’s Pakistani People’s Party) that the government has stuffed the whole Taliban thing up. Yet still the Obama administration has no option but to deal with the elected government. Asif Ali Zaradari is scion of Pakistan’s feudal political establishment, as are many in his PPP and in other more secular parties such as Opposition Leader Nawaz Sharif’s Pakistan Muslim League. The vast majority of Pakistanis live in villages and certainly are not wealthy land owners. The Taliban could repeat the same strategies in other Pakistani provinces, orchestrating what could become a peasant-based revolution. However, victory for the Taliban isn’t just as easy as pitting peasants against feudal lords. What many Western observers forget is that the Taliban’s style of Islam is deeply unpopular in a region where the indigenous Muslim culture has had centuries of interaction with (and influence by) other faiths such as Hinduism and Sikhism. The Taliban’s narrow sectarian agenda worries Shia Muslims, who make up around 20% of Pakistan’s population. The Taliban regard Shias as non-Muslims and have already shown disdain for at least one minority. Still, the Taliban are only within 100 miles of the Pakistani capital. As Pakistani troops march in, an army of refugees from the Swat Valley are marching in the opposite direction, many headed for refugee camps once occupied by Afghan refugees fleeing Soviet invaders. First published in Crikey on 7 May 2009. VIDEO: Just how serious is Obama about ending torture? As Barack Obama prepares marks his first 100 days in power, pressure is mounting to hold the administration of George Bush, the former US president, to account for its role in authorising torture. While it's still unclear whether anyone will be charged, Al Jazeera's Avi Lewis sat down with a panel of experts to find out where the debate over torture now stands. You only need a smattering or Urdu and access to Pakistani cable TV news channels to understand just how worried many Pakistanis are about the Taliban incursions. Government officials surely must be worried about the Taliban's ability to win hearts and minds, especially if this report in the New York Times is anything to go by. The government in Islamabad is seen as representing more of the feudal economic status quo. One can hardly expect the Pakistan Peoples' Party government to do much about land reform when the PPP is dominated by wealthy land owners. Even the Predident Asif Ali Zardari comes from a land owning family. Successive Pakistani governments have since failed to provide land reform and even the most basic forms of education and health care. Avenues to advancement for the vast majority of rural poor do not exist. But why would people turn to the Taliban for social justice? After all, they know that the Taliban will close down girls' schools and stop women from going into the marketplace. The Taliban are also notoriously anti-Shia, and will close down many traditional Sufi shrines that play an important role in the indigenous folk Islam. The strange thing is that at the last Pakistani elections people in Swat, like in so many places in the "tribal areas", refused to vote for religious parties. Instead they opted for secular parties. Some nights back, I saw a TV debate on Aaj TV in which Pakistani analysts were questioning the Pakistan Army's ability to defeat the Taliban. It's impossible to overstate the impact that the takeover of Swat has had on the country. 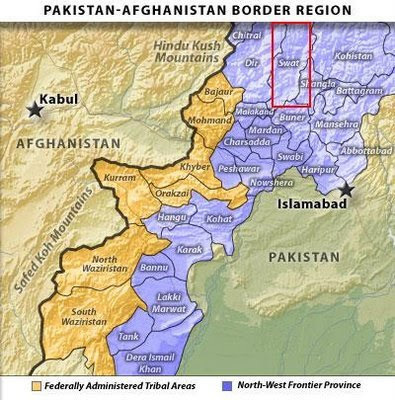 Swat may be among the "tribal areas", but it is still only within 100 miles of Pakistan's capital Islamabad. Here is the text accompanying the video from AlJazeera English concerning the extraordinary rendition of Canadian citizen Maher Arar. MEDIA/VIDEO: Are American print newspapers dying? Here is the text accompanying this video from Al-Jazeera English. US newspapers are battling to survive amid a recession and changing technologies that are leaving even the best known titles struggling. John Terrett went to Roanoke in the state of Virginia to find out how one newspaper is managing to stay afloat in stormy times. There is a popularly-held notion in some Australian media sectors that the people in areas now ruled by the Taliban are somehow less cultured and more intolerant than people in other parts of the country. It's as if anyone who comes from the same ethnic background as the Afghan and Pakistani Taliban leadership - anyone from a Pushtu-speaking tribe - must share the Taliban's intolerance. Yoginder Sikand is an Indian writer and commentator who has written extensively on South Asian Islam. He notes that North Indians, including those from Punjab and the from the Pushtun regions, share much of their religious heritage with non-Muslims. Sikand provides numerous instances of this shared heritage during his travels across Pakistan. 'Numerous Punjabi Sufi saints, whose works are still immensely popular, are known for their breath of vision, seeing God's light in every particle of the universe, in the mosque as well as the temple', says Saeeda Diep, my host in Lahore. She takes me to the shrine of Madho Lal Husain in downtown Lahore, a unique Sufi dargah that houses the graves of two male lovers, Madho, a Hindu, and Husain, a Muslim, who were so close that they are today remembered by a single name. She waxes eloquent about the unconventional love relationship between the two that angered the pundits and mullahs but won the hearts of the masses. This is the folk religious culture of Pakistan, which borrows from various Indian faiths including Islam, Hinduism and Sikhism. The special role Sikhism plays to this day among Punjabi Muslims is well known, as Sikand discovers when he meets of Sufi Muslim. In Lahore I also meet Pir Syed Chan Shah Qadri, the custodian of the shrine of the sixteenth century Sufi Hazrat Miyan Mir. The saint was the spiritual preceptor of Dara Shikoh, son of the Mughal Emperor Shah Jahan, a renowned mystic in his own right. Dara was the first to translate the Upanishads [ed: Hindu scriptures] into Persian and sought to draw parallels between Hindu and Islamic mysticism and thereby bring Hindus and Muslims closer together. Hazrat Miyan Mir was no less of an ecumenist, the Pir tells me. In recognition of his spiritual stature, he was invited by Guru Arjan Dev, the fifth Sikh guru, to lay the foundation stone of the Harminder Sahib or Golden Temple in Amritsar, the most holy shrine of the Sikhs. The Pir informs me that many Punjabi Muslims still look upon Guru Nanak, the first Sikh guru, as a great mystic in the Sufi tradition. 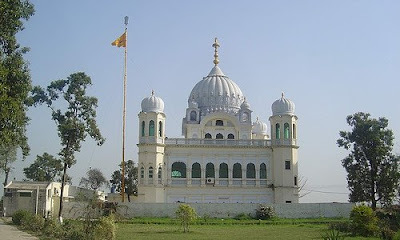 Pushtun (also known as Pathan) Muslims also have a special relationship with Sikhs which has strong historical roots in the Sikh faith and extends to times when Sikhs were persecuted by Indian Muslim kings. In Syed Chan Shah's home I am introduced to Zahoor Ahmad Khan, seventh generation descendant of two Pathan brothers Ghani Khan and Nabi Khan. When Gobind Singh, the last guru of the Sikhs, was pursued by Aurangzeb's forces, he was sheltered by the brothers. They disguised him as a Muslim saint, the Pir of Ucch Sharif, and, carrying him in a palanquin, they slipped through the Mughal lines. In gratitude, Khan tells me, the Guru presented them with a letter written in his own hand, announcing that, as Khan says, 'Whoever among my followers loves and protects these two brothers loves me, too'. In recognition of the service rendered to the Guru by the brothers, Ranjit Singh, the founder of the Sikh kingdom in Punjab, granted their descendants a large estate in Mandara, a village in present-day Indian Punjab. The family resided in the estate till 1947, when, during the Partition riots, they fled to Pakistan. 'When the whole of Punjab was burning, when Hindus and Sikhs in western Punjab and Muslims in eastern Punjab were being massacred and driven out of their homes, the Sikhs of Mandara pleaded with my father and other relatives not to leave. But we had to, so terrible was the situation then', says Zahoor Khan, who was a young lad of fifteen when he came to Pakistan. Last year he went back to his village for the first time since he and his family had left it, at the invitation of a Sikh organization that seeks to revive and preserve the memory of the two Pathan friends of Guru Gobind Singh. 'I was given an enthusiastic welcome when I arrived in Mandara. The whole village came out to greet me', says Khan, his eyes brimming with tears. In fact, many Muslims revere the Sikh gurus, amongst them the founder of Sikhism Guru Nanak. Also present during our conversation is Naim Tahir, a middle-aged, soft-spoken man, who introduces himself as a descendant of Bhai Mardana, Guru Nanak's closest companion, a Muslim of the Mirasi caste. Tahir tells me about the relationship between his ancestor and Guru Nanak. Both Guru Nanak and Bhai Mardana were born in the village of Talwandi, and grew up together as friends. 'Bhai Mardana had a melodious voice and used to play the rabab', and 'when Guru Nanak began his spiritual mission of bringing Hindus and Muslims together in common worship of the one God and denouncing caste and social inequalities, Bhai Mardana joined him. Together they traveled together to various Hindu and Muslim holy places, including even Mecca and Medina. Guru Nanak would compose his mystical verses or shabad and Bhai Mardana would sing them while playing the rabab'. Tahir tells me that his family tradition of singing the verses of Guru Nanak and other Sikh gurus has been carried down through the generations. 'Yes, we are Muslims,' he says, 'but there is nothing in the teachings of Guru Nanak that is incompatible with Islam. In fact there are many verses in the Guru Granth Sahib written by Muslim Sufis, including the well-known Chishti saint Baba Farid'. Tahir confesses to know little else about Bhai Mardana, other than the fact that after Guru Nanak died he traveled to Afghanistan and is buried somewhere there. 'You should speak to my father Ashiq Ali Bhai Lal about this', he advises. 'He has even sung shabads in the Golden Temple and is regularly invited to sing in gurudwaras and gurumandirs, Sindhi Hindu shrines dedicated to the Sikh gurus, in different places in Pakistan'. This is the reality of religious coexistence on the ground in Pakistan and has been the case in this region of the sub-Continent for centuries. The Taliban represent an historical and theological aberration. Condoleezza Rice's attempts to clarify her expressed views on the legality of torture are about as clear as mud, as the following video from AlJazeera English illustrates. The text accompanying this video is below. Condoleezza Rice, the former US secretary of state, has dismissed claims she approved the use of torture when she was US National Security adviser. The former secretary of state caused a storm when she said if harsh interrogation methods were authorised by the US President, then they were not illegal. Al Jazeera's Monica Villamizar asked her about the controversy her statements have caused. AFGHANISTAN/VIDEO: US troops caught out evangelising among Afghans? US troops are caught with resources to convert Afghan locals to Christianity. This is a serious development. The video footage below was taken 12 months ago. Who knows how long all this has been happening? The sensitivity of religion in this part of the world cannot be over-emphasised. This kind of video footage can and no doubt will be used by Taliban propagandists to undermine the Karzai government. This could well threaten the security of our own troops. The US army has some explaining to do. So does Kevin Rudd. The text accompanying the video is reproduced below. US soldiers in Afghanistan have been filmed with local language Bibles and urged to be "witnesses for Jesus" despite anti-proselytising rules. Al Jazeera's James Bays reports. Malcolm Turnbull didn’t become a multimillionaire by being a stranger to big business. This former merchant banker, lawyer, internet entrepreneur and corporate wheeler-and-dealer knows his Party’s relationship with sections of the business community is the closest financial and institutional equivalent it has to the ALP’s more formalised relationship with the trade union movement. ... as reported in The Australian today, Turnbull will listen carefully. There’s just one problem. The 14 MP’s listed as dead wood by these business donors include powerful forces in the NSW Right. While business donors may hold the purse strings of the NSW Party, the Right Wing holds the Party’s t-sticles. Among those on the corporate hit list is NSW Senator Bill Heffernan. "Farmer Bill" (as the former President of Junee Shire Council is known in urban Party circles) was elected to the Senate some months after the Howard government was swept to power in March 1996. Heffernan employed a rightwing Young Liberal powerbroker named Nicholas Campbell. The NSW Right were at that time weak in both the Young Libs and the Big Libs, but their star was rising. Today Mr Campbell is President of a NSW Liberal Party firmly controlled by the Right. Campbell is likely to use his considerable Machiavellian skills to protect his old employer’s position ... unless Campbell himself is Heffernan’s likely replacement. The Right will also do anything to protect Bronwyn Bishop, whose electorate of Mackellar takes in the NSW State electorate of Pittwater currently held by 34 year old Rob Stokes. A former environmental lawyer, Stokes served as electorate officer (read branch stacker) to former NSW Opposition Leader (and Liberal Left powerbroker) John Brogden. Together, they actively stacked local branches with lots of small-‘l’ liberals, to the extent that the Left almost had the numbers to challenge Mrs Bishop in a preselection. Bishop was paranoid of Brogden and she wouldn’t exactly be stoked by the young Stokes. Her departure will almost certainly see a small "l" liberal be the next MP for the blue ribbon Liberal seat of Mackellar. A Left MP will employ Left staff with time and resources for factional work such as stacking the nearby branches of Tong Abbott in the adjoining seat. So Turnbull is in a Catch-22. On the one hand, his Party may find its biggest donors withdrawing their financial support unless he brings in new talent. On the other hand, this could involve going to war against powerful rightwing warhorses in his home state. Watch this space. Then again, my entire analysis might just be dismissed on the basis that the report in The Oz is just a case of Glenn Milne reproducing what he’s learned from Mr Costello’s office. In which case, nless Costello is again setting the scene for a possible challenge that is unlikely to eventuate, ignore this space. First published in Crikey on Monday 4 May 2009. Arianna Huffington, former Republican and ex-wife of a Republican, addressed the Commonwealth Club of California before the US Presidential Election. She reminded her audience of the difference between the mainstream media and the blogosphere. Huffington declared that the mainstream media was Attention Deficit Disorder (ADD) while bloggers have Obsessive Compulsive Disorder (OCD). The “MSM” allows the real story to get through while bloggers keep focussing on the same stories over and over again, even when they are on the mark. So what illness should we attribute to columnists and journalists in the mainstream media who also have blogs? You can watch Huffington's hilarious address below.